Truth, memory and history are constantly destabilised in the works of the Pakistani artist. "By presenting exaggerated scenarios of a nation that takes refuge in a selected glorious past, I hope to engage viewers in questions about the need or the extent to which we limit our identities," the video artist Bani Abidi has explained. Ostensibly about history, her documentary style works are in fact deeply suspicious of history throughout the world. Abidi attempts something of a tightrope act. She articulates an ambivalent position when presented with the extreme political setup: for example, the construction of a national identity using mono-historical means that conjure up a distorted situation, namely the current "throes of a Wahab-i-sation of local Islamic cultures in Pakistan" . Composed as a fictional trilogy of photo and video narratives – The Ghost of Mohammad Bin Qasim, The Boy Who Got Tired of Posing, and This Video is a Re-enactment (all 2005) – the works' central figure is the Arab General Mohammad Bin Qasim who conquered Sindh – the province of Pakistan that contains its capital in Karachi – in 712 A. D. and thus can be referred to as the first model citizen of Pakistan. During Zia ul Haq's  process of Islamization in the 1980's, school textbooks and nationalist novels were re-written to convey the message of Pakistan as a nation state instantly and inextricably linked to the history of Islam. Consequently history as written in school textbooks ignored the civilizations, cultures and religions that had lived in the region that is now Pakistan. Alarmingly, students were denied knowledge about a rich and tolerant strain of Islam practised for centuries throughout the subcontinent. In The Boy Who Got Tired of Posing, three portrait studio photographs of young Pakistani boys dressed up as Arab warriors offer up an idea of how far this cult was exploited and carried into daily life. 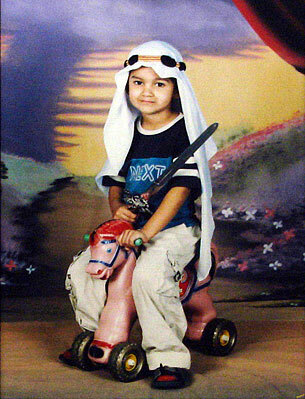 During the 1980's it had become popular in urban centres of Pakistan to have one’s young sons photographed as Mohammad Bin Qasim. Yet we are also confronted with a fourth image, a studio scene with a chair and an Arab dress on the floor, its temporary owner having hurriedly left the set. For the role of The Ghost of Mohammad Bin Qasim, Abidi invented the character of Yusuf Khan. This young Muslim convert from Hyderabad poses in front of historical and contemporary Muslim sites all over Pakistan as a Don Quixote in an Arab dress carrying a flag, believing himself to be Mohammad Bin Qasim. In a series of eight black-and-white photographs of Yusuf Khan, the artist abstracts the emotions the State intends to foster by suspending the horse-riding figure slightly above the ground. By further manipulating the proportions, these constructed images do not so much stage history as mock it, ridicule it and dismiss it. Bani Abidi's work is imbued with her country's long-term and paradoxical short-term history and reminds the viewer that any reconstruction and revival of the past is full of pitfalls. It is too easy to romanticise the past and gaze back through rose-tinted spectacles or to put a spin on past episodes only to serve current political ends. Despite its documentary purpose, photography and video in Bani Abidi's work are obviously a provocative mixture of fact and fiction, where the final corruption through digital manipulation reminds us that the other corruption – a state-organized strategy – is a huge dilemma. Yet, the solution may lie in the one image of the boy who literally got tired of posing: here the artist trumps history, and elbows it aside, destabilising it to remind us that we can still find strategies to object to a narrowed and limited collection of irrelevant facts. Pablo de Ocampo, the curator of this exhibition, links Abidi's work with that of Walid Raad and the works of The Atlas Group by means of interrogating historical records. The similarity in their work may be located in the way they both explore the trauma of history. Yet, while Raad's projects are ongoing bodies of work, Abidi's works are completed single projects. Both their work is part of the documentary mode prevalent in much current art practice around the world. Successful work done in this documentary mode relies on the subtle but direct questioning of the principles by which something, anything, is legitimized as "truthful". Issues of truth, memory and history and the categorization of people on a religious or cultural base are constantly destabilised. Bani Abidi, from a personal interview with the artist in France, September 2007. Zia ul Haq came to power in a coup in 1977. His oppressive regime reigned the country till 1988, when he mysteriously died in a plane crash. Art historian. Author of the book "Modern Art in Pakistan. History, Tradition, Place", published in 2014 by Routledge in New Delhi. Death at a 30 Degree Angle. Statement by the artist about her video project presented at dOCUMENTA (13) in Kassel, Germany.